Walk back in time as you descend through almost two billion years of rock to the bottom of the Grand Canyon. The South Kaibab trail drops about 5,000 feet for an exhausting but spectacular journey into one of the seven natural wonders of the world. The shuttle bus will drop you off at the trailhead, which begins just south of Yaki Point. Fill up your water bottles at the refill station before you start down the trail, as you won’t find water again until you get to Bright Angel Campground. This trail has the reputation of being one of the shortest and quickest routes to the Colorado River. According to Park Service estimates, hiking times range between 4-6 hours to get to Phantom Ranch. They discourage hikers from hiking down to the river and back to the rim in the same day. If you aren’t planning an overnight backpacking trip, a day hike to Cedar Ridge (1.2 miles) is a nice option. From the rimside interpretive signs, begin down the maintained gravel trail. 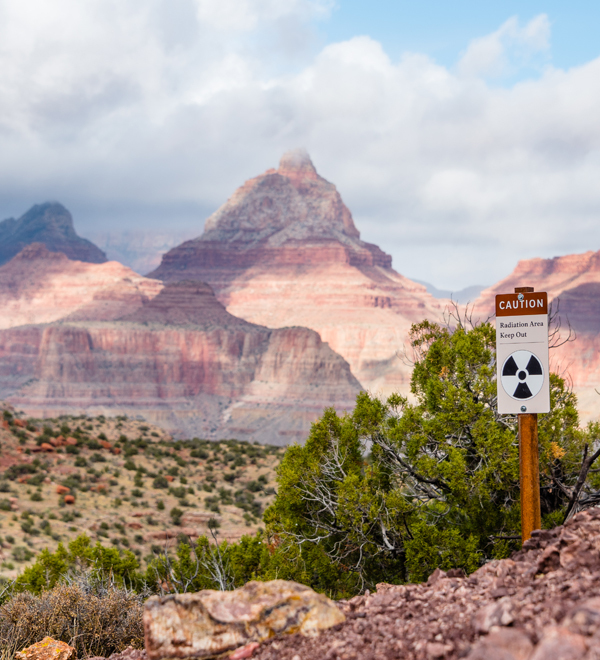 You’ll waste no time descending with a series of tight switchbacks quickly taking you down through the youngest rock exposed in the canyon, the Kaibab Limestone. While scientists still debate the age of the Grand Canyon itself, the rock layers that are exposed in the canyon’s walls, and that you pass through on this hike, take you two billion years into Earth’s geologic history. A half mile of switchbacking leads to a bench where the trail levels out and continues north below Yaki Point. 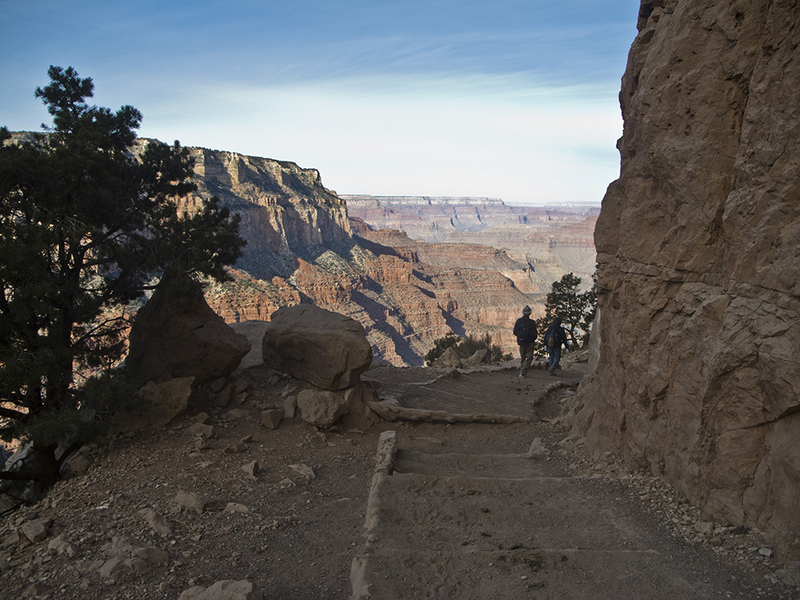 Your gradual descent affords glimpses of the greater Grand Canyon, but it’s not until you arrive at Ooh-Ah Point a mile down the trail that the canyon opens for your first panoramic view. Across the canyon, terraced plateaus step up to the North Rim, and the different rock layers and plants paint a rainbow of pastels across the landscape. 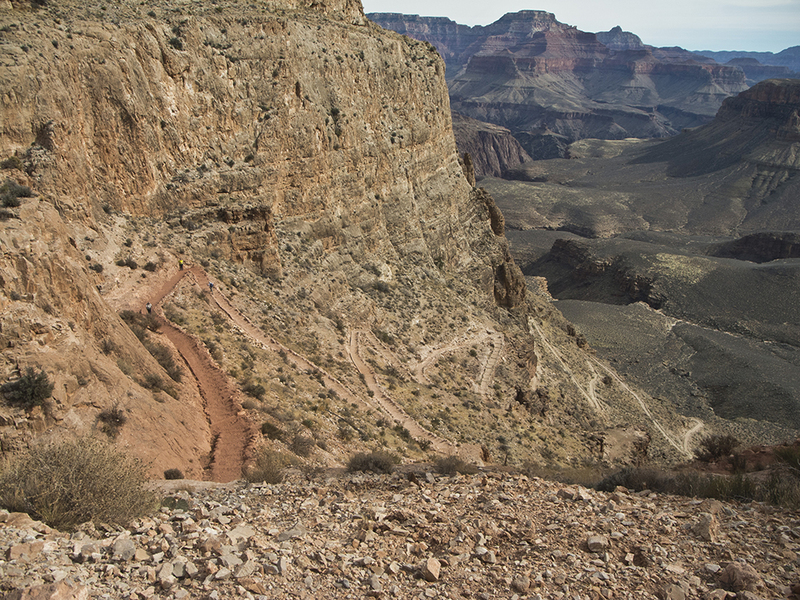 Just ahead, you can trace the South Kaibab trail around a promontory called O’Neill Butte. From Ooh-Ah Point, the trail steeply switchbacks down through Coconino Sandstone with some beautiful crossbedding. Logs and rocks on the trail form an approximate staircase, with steep dropoffs to the Pipe Creek drainage on your left. By about 1.2 miles, the switchbacks end in a gentle slope just before Cedar Ridge rest area. Pit toilets are available here, and while juniper trees provide pockets of shade, the ridge is otherwise barren and exposed. Follow Cedar Ridge north towards O’Neill Butte, where a gradual decline replaces the knee-busting switchbacks. Brahma and Zoroaster Temples, iconic buttes on the north side of the canyon, serve as reference points. Their respective rounded and triangular white promontories lie east of Bright Angel Campground and Phantom Ranch, your final destination. Enjoy the brief leisurely stroll — this half mile of flat hiking ends when you reach Skeleton Point around 2.75 miles. After crossing a saddle, the trail and plunges 650 feet down switchbacks that have been blasted into the limestone cliffs. At the base of these cliffs, you reach the green slopes of the Tonto Platform. This recognizable layer in the Grand Canyon parallels both sides of the river, though 1,500 feet above it, and creates a relatively flat route for hikers to access the inner canyon. 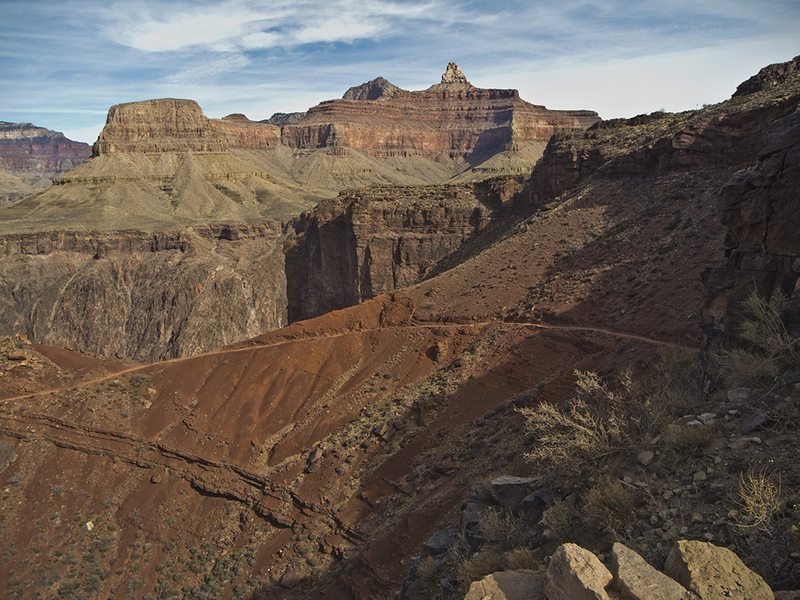 At around 4 miles, the South Kaibab trail intersects the West and East Tonto trails at what is called the Tipoff. Pit toilets and an emergency phone are available here. You’ve descended three-quarters of the way into the canyon and have about 1,500 feet left to go. Leaving the Tipoff, you hear rushing water and catch a glimpse of the Colorado River shortly thereafter. The trail maintains a gradual grade as it contours along the Tapeats Sandstone, but the ledgy, cobbled rock soon gives way to the grey and pink granite walls that characterize the inner gorge. These “basement rocks” of schists, granites, and gneiss are about two billion years old — the oldest rock in the canyon! For the next mile, the trail gradually descends around the cliff’s contours. Again, you see evidence of the trail having been blasted into the otherwise unyielding metamorphic canyon walls. Around 5.3 miles, start down the final series of switchbacks that takes you to the bottom of the canyon. You reach a junction with the River trail in a half mile; follow the arrows pointing to the right and continue along the South Kaibab trail. 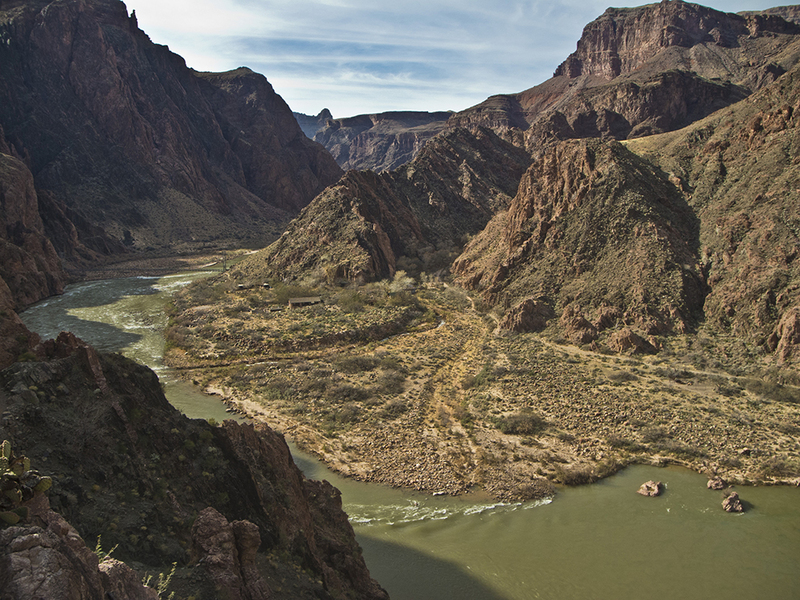 At 6 miles, you arrive at a suspension bridge that crosses the mighty Colorado River. Depending on the time of year, the river may be running emerald green or muddy brown. The Colorado is the main artery and watercourse in the Southwest, and summer monsoon rainstorms funnel silt and debris into the river through its many tributaries. You might also hear “yehaw’s” as rafters float down the river and navigate the rapids. Once across the bridge, continue on the north side of the river, heading west along the bank. You pass a beach and a picnic area, where river trips frequently stop, on your left before arriving at Bright Angel Creek. Cross the small bridge following signs to Bright Angel Campground. The trail turns north as you hike along the west side of the creek. Camping is by permit only, and campsites begin around 6.5 miles. Continue another half mile to Phantom Ranch, where you can buy snacks and cold beverages, play games, and mail a postcard from the canteen. Shuttle buses provide transportation to the South Kaibab trailhead. They run regularly from the Backcountry Office and the Canyon View Information Plaza throughout the day. A special hiker shuttle runs early in the morning. Check the park newspaper or the Backcountry Office for current information. 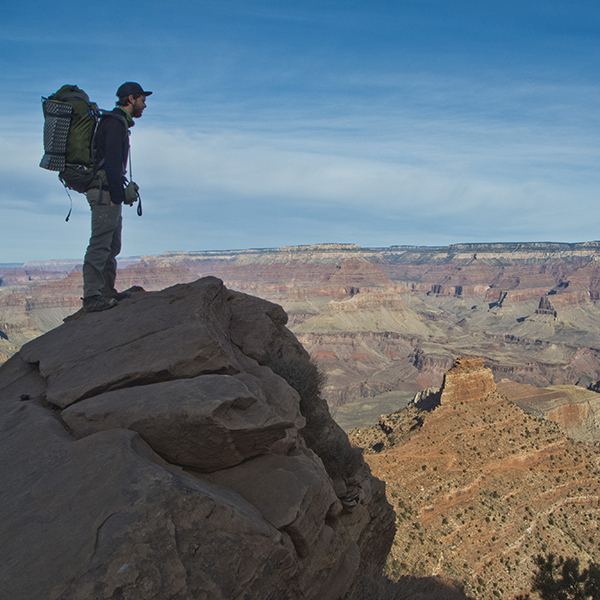 Fee required – Camping below the rim requires backcountry permits and additional fees. Check the website listed below for current information.